One reason the spider chart is so important is the fact that while the economy is recovering, not all is well with the labor market. As our office detailed much more thoroughly in the previous three part series on unemployment in Oregon (Part 1, Part 2, Part 3) the divergence in outcomes for the short-term and long-term unemployed is particularly pronounced. Furthermore, given the depth of the Great Recession and lackluster recovery, we saw the ranks of the long-term unemployed swell to historic highs (at least in recorded history). How does the labor market function, if at all, for those unemployed relatively recently compared with the long-term unemployed? Well, according to updated BLS data, the good news is the probability of finding a job if one is unemployed has improved in the past couple of years, regardless of how long one has been unemployed. However, the longer the spell of unemployment, the lower the probability of finding a job and the higher the probability of dropping out of the labor force all together. 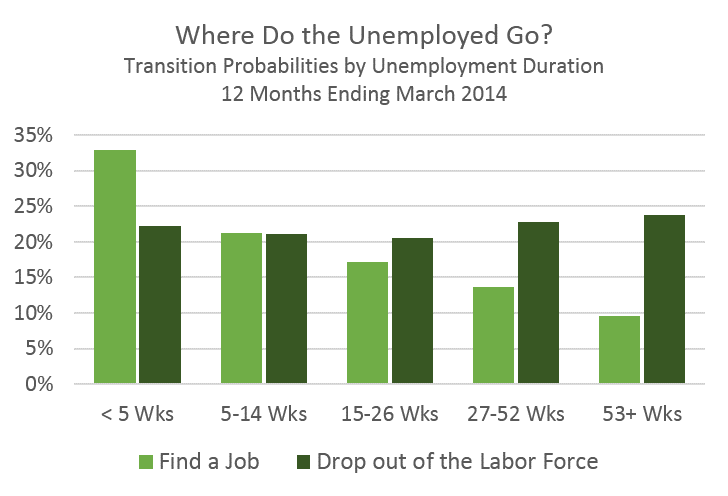 Only those unemployed three months or less have a higher probability of finding a job than dropping out. All data are U.S. figures. 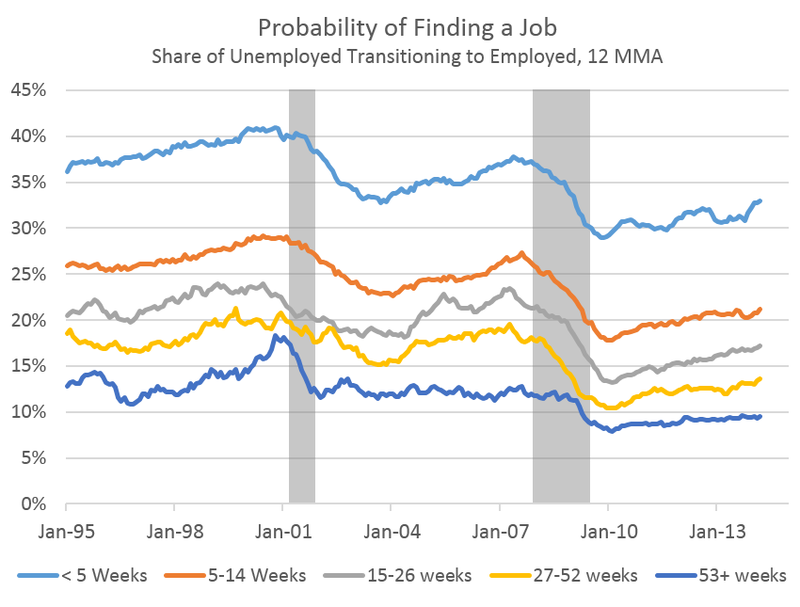 This second graph shows the probability of finding a job over time. A few things stand out. First, the probability of finding a job during the housing boom was lower than during the 1990s and it is even lower post-Great Recession. Second, for each duration of unemployment, the probability of finding a job today is higher than it was last year and certainly above the lowest rates back in 2010. Third, notice the 53+ weeks line back in 1999. During the tight labor market of the late 1990s — arguably the last time the U.S. economy was truly at full employment — we saw employers begin to hire the long-term unemployed in greater numbers. In order to bring down the long-term unemployed today, at least find them jobs and not have them drop out of the labor force all together, the labor market will likely need to tighten sufficiently for the new entrants and recently unemployed before employers will begin to hire the long-term unemployed. Focusing just on the long-term unemployed, recent changes in their labor market prospects have been both good and bad. Since 2010, the probability of remaining unemployed has fallen nearly 7 percentage points. 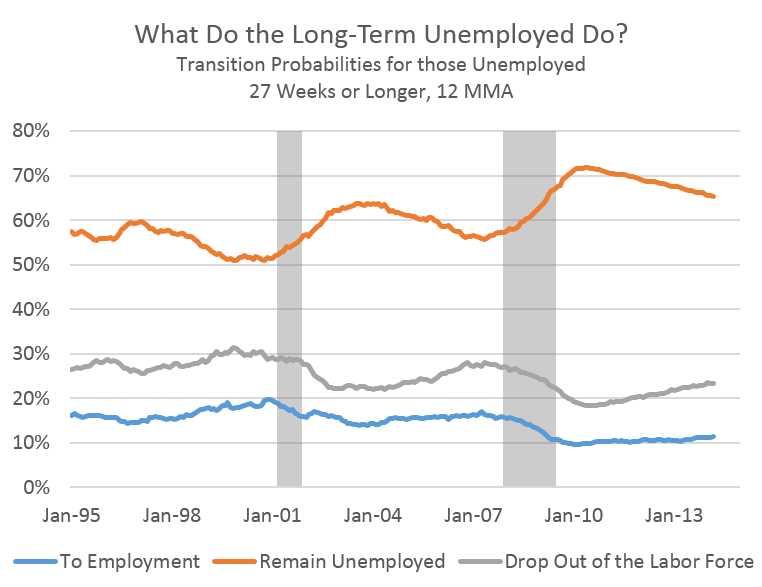 About 30 percent of this improvement is due to more of the long-term unemployed finding jobs, however the other 70 percent decline in the transition probabilities is due to an uptick in those dropping out of the labor force. So the long-term unemployed are able to find jobs at a slightly higher rate than in recent years, however they are also more likely to given up their search, at least for the time being. These are certainly important trends to follow in terms of gauging the overall health of the labor market. Given the large numbers of long-term unemployed, keeping them in the labor market and finding jobs is a major economic issue today. The data above come from BLS research series, which are not updated every month, so our office will highlight them when they are, such as this latest update which became available this week.